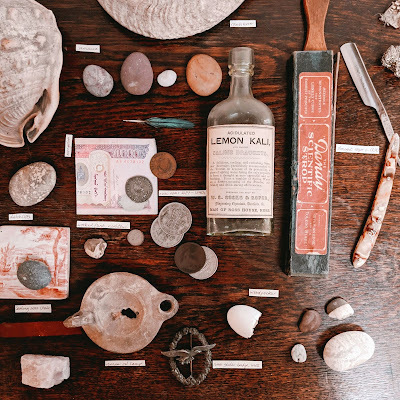 Enter the Wunderkammer and be inspired by the objects within! A creative writing workshop with award-winning poet Rhiannon Hooson, which draws on a collection of curious, intriguing, and remarkable objects to inspire, appall, and delight. Together we will examine wonders from the natural world, ancient pieces from the past, and objects that have inspired artists from all walks of life, and create poems based on their intriguing histories. Whether you are an experienced poet or a beginner, come along and be inspired! This workshop will take place in August at Whitton Old School in Powys, but will also be available to pre-order as an ONLINE WORKSHOP. Afternoon workshop at The Old School, Whitton. Date and time tbc, 24th or 25th August. 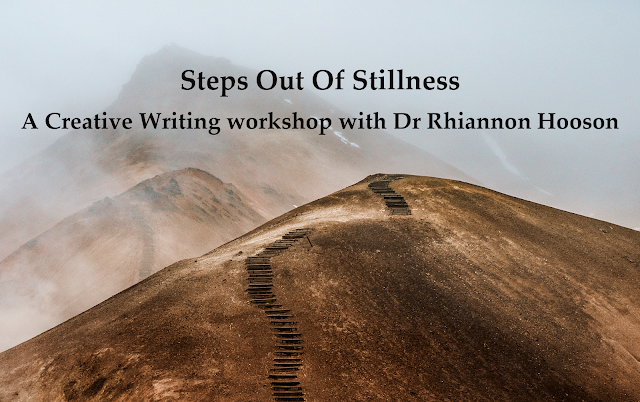 As a part of making my workshops more accessible to all, I have decided to offer selected workshops as one-off online creative toolkits that will be offered at the slightly discounted rate of £25. This will allow you to take the same workshop as those at the day events, but in your own time, and in your own home. A comprehensive and detailed breakdown of all the themes explored. Inspirational prompts and creative techniques to help you get the most out of the workshop. A structured progression of exercises to complete in your own time, designed to guide you through the creation of several pieces of work. Suggested further reading and printable worksheets. 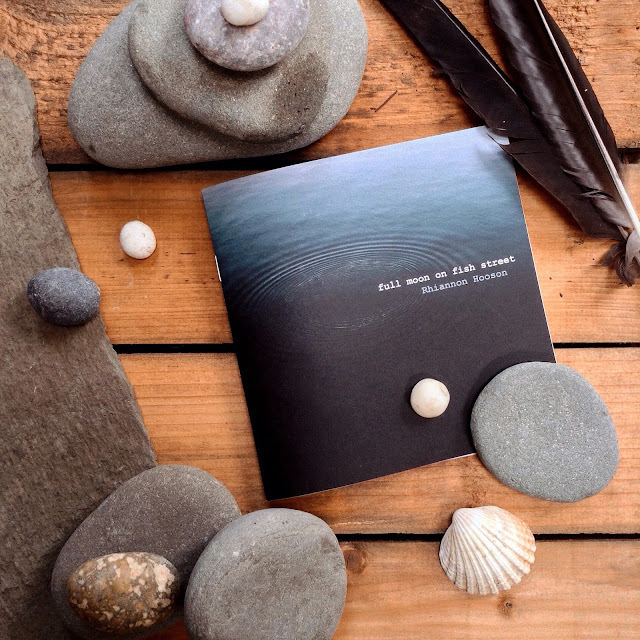 On Sunday the 26th of August, in the roar of the rain, I launched my new pamphlet Full Moon on Fish Street in the gallery at the Radnorshire Arts and Crafts Foundation. It was a wonderful morning and a packed house! I was thrilled when fellow poet Emma van Woerkom agreed to come and read along with me, and enjoyed every minute of her wonderful reading. 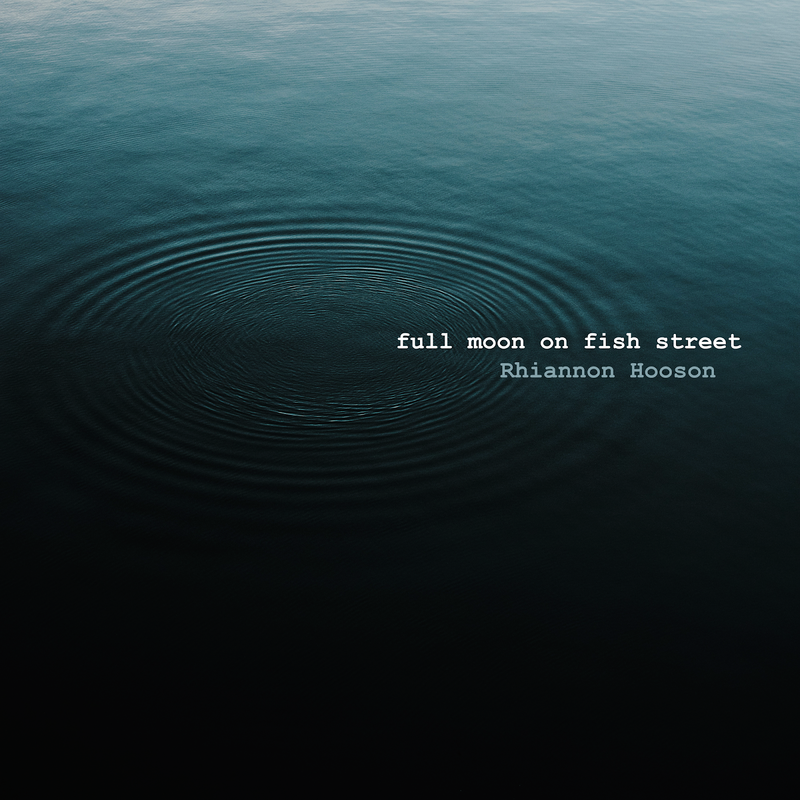 Full Moon on Fish Street is a chapbook of poems and prose that tell a story. Put simply, it's a story about an artist and her muse. But things are never that simple, are they? The thing I love most about Full Moon on Fish Street is that it's a story with a secret. I don't think the secret will be obvious on the first reading, but it is there, like a flash of silver hiding between pebbles on a beach. If you'd like to purchase a copy, head over here to my publications page. Full Moon on Fish Street is printed on recycled paper, and each one of the 100 copies printed has been signed and numbered by me. Really pleased to announce that I am now Poetry Editor at Creative Countryside Magazine! Earlier this year I wrote a piece on taking inspiration from a familiar landscape for their Spring issue (still available here). I loved working on it, and have been a fan of the magazine since its first issue back in Autumn of last year. It's a beautifully produced magazine. Although the title of my book is The Other City, I grew up in the countryside and take enormous inspiration from the natural world now that I'm back in it after a few years of living in cities. 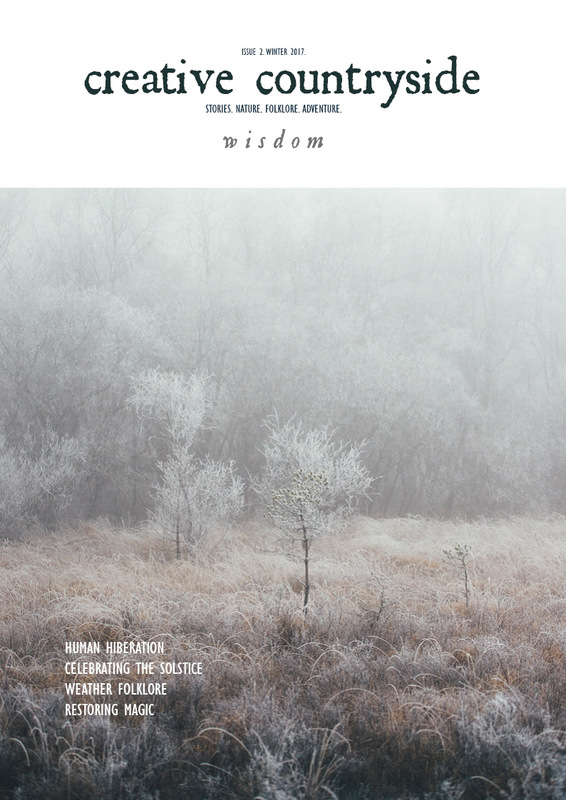 The ethos of the magazine is one I can fully get behind: Wholehearted slow living. Embracing the seasons. The sharing of stories and traditions. A sensitivity to the environment and the ways in which it might inspire us. It's rare among magazines for being entirely advert free which says a lot. Its focus is not just poetry but on simple, sincere creative non-fic from around the UK that aims to capture the magic of the turning year. As poetry editor I aim to source diverse work with an emphasis on up-and-coming poets. If this is you, I would love you see some work! For submissions guidelines, please see my contact & submissions page. The train seems to speed along a secret promontory in the landscape, away from which precipitous towns tumble toward their estuarine heartlands. From its windows fields of flowering gorse are visible between tangled banks of brambles; in gullies crowded with stunted oaks and elder, moss covers everything. Gulls roost in the empty golf courses. It is a strange, arrested landscape: the climate’s urge towards lushness is halted by the sea wind which blows over everything, always. Slowly the rain lessens and is replaced by a skimming of cloud and the thin sun intermittent on water. A heron circles its own shadow and lands in the shallows of the river’s spread. The splayed ribs of a sunken boat rise out of the water here, black as charcoal, like some reticulated beast. At St Erth there are periwinkles tangling around the signposts along the platform. Wooden railings painted in thick white paint separate the London – Penzance platform from the St Ives branch line. There are flowers growing in concrete troughs, and in the old ticket office a little tea room sells scones and bacon rolls. The smell of hot bacon drifts out onto the platform along with a muffled strain of Sinatra. Inside the walls are papered with romantic old railway posters of painted landscapes, their blues and yellows almost psychedelic in their brightness. Penzance and Guernsey glow from their little squares alongside Whitby and the Lakes. Next to one of the three small tables is one advertising Herefordshire ("Fair land of enchanting beauty!”). I choose a seat there, drinking hot chocolate that comes with two ginger biscuits balanced on the saucer. Outside a wagtail hops about in the softened air. The kind of drizzle is falling that remains invisible until you are wet. Each half hour a train for St Ives pulls up to platform 3 with its dead end butted up against the little ticket office, disgorges three or four passengers, then moves off again the way it came. The beleaguered lelandii along the track have grown enough to offer silhouettes like Scots pines to the sky. Along the way, the old tin sheds and engine houses have been grubbed up to make way for a park and ride car park, but as yet only two long mounds of earth are in evidence, and a small bonfire of builder’s waste that burns in daylight with a strange pale flame that the wind makes furtive. Later, from the St Ives train, curtains of light slide across the sands, touching wet rock and the sandpipers that move in that shifting ribbon of no man's land that is not the beach, but not yet the sea either.